Design Burd Inc.Widget ya know? | Design Burd Inc.
Design Burd always loves to add a littleÂ pizzazzÂ to their client's sites! 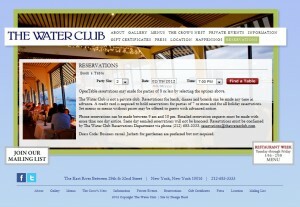 Â We integrated custom widgets to the sites of two of our favorite New York City restaurants, The Water Club and The River Cafe, using OpenTable! Â Next time you make a reservation, (maybe to treat your valentine to a decadent meal?? ), you can do it right from their sites!